38 out of 38 (100.00%) customers would recommend this product to a friend. All is good with this product, it is working as it should. We have bought this before and it works great and the price is even better! Bought this one to replace a newly purchased cartridge from another company that went belly up after a day of use. Great value! !....and it works! Great toner! Great pricing. Fast shipping. Overall Very happy. Have used several of these toners and never had a problem with them. Good shipping, it arrived in two days in good shape!. Great product, long life, and at a bargain price versus big box retail. Great alternative to the factory cartridges at a far better price. This cartridge was a perfect replacement alternative to buying new original manufacturer cartridges. I not only saved money but got more out of these cartridges than I would have if I purchased from HP. Definitely reordering again! The HP Yellow Compatible Toner Cartridge is great. It's the only one that I buy. It's just as good as HP products but it's cheaper. You get good quality for less money. Try it. I recommend it for anyone who have purchased HP products. I have recommended your company to coworkers. Works perfectly in my HP printer. It was a great price, easy to order, arrived on time and easy to unpack and use. No Problems with ink or cartridge. And worked in my HP Printer without any errors. No issues with this product. Works great with my printer. Product arrived quickly and as described. Print quality is great. The website said the product would be in the office in 5 business days, and sure enough , it was ! This toner is a great alternative to the HP brand. Great print quality and inexpensive! Great toner and price. Would buy again. Would recommend to business owners in the area. We will definitely purchase this again. Very good quality. No problems. Works as well as HP ink and better price! Great value and great service. Delivery time was quick as well. Works Great. We will buy again...nice packaging too, and much cheaper than oem. Great price. Product arrived quickly and in good condidtion. Works perfectly. I had previously ordered toner from another supplier and it leaked all over my printer, caused streaking across my stock, and I ultimately returned all of the toner for a refund. I am pleasantly surprised that the toner I purchased from you was packaged well, is easily inserted into the HP, and the quality is excellent. Great product, would definitely purchase again. Same quality as a genuine HP ink cartridge. I haven't had any problems. It works good in the printer. I'm about to buy another 2 sets. Fast shipping, easy to install and quality is great. Seems to work fine. Just installed Will notify if problems arise. Excellent price & service. Shocked I could get good ink for my printer at such a reasonable price. It's worked great! The product arrived timely, was packaged well and was exactly as described. It installed easily and is now working well. I am pleased with the product so far. So far so good. Thank you Ink Technologies!! The ink arrived very quickly and I don't see a difference in quality! It prints great and I will be ordering over and over from here....thanks Ink Technologies! This print cartridge is well worth the money. 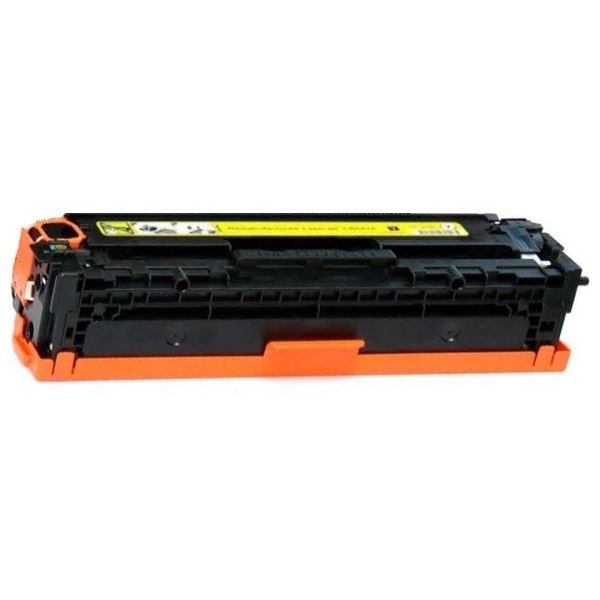 This Compatible HP Toner Cartridge (Yellow, High Capacity) arrived promptly and was an exact physical replacement for the factory supplied unit. Its operation has been excellent. $35 compared to $89 ... I'll take it. And the product is just as good. Thank you for the savings. I have purchased this many times and appreciate the good price and the lack of any issues with this compatible cartridge.Recommended. I researched many sources for toner for my new Laser all-in-one. This was the best price and even more toner that OEM. Cartridge fit perfectly. The printer had no problem recognizing it. The color Is clear and crisp. I will order again.